When it is golden brown in color, take out in a dish. Delicious Egg Scotch is ready to serve! Grind green coriander, mint, green chilies and tamarind either in a grinder or with a grindstone. Add salt as required. Make thick paste of chatni otherwise it won't stay on the egg. Boil potatoes and peel its skin off. Mash by pressing with hands. well. Potato mix is ready. Halve boiled eggs lengthwise. Apply green chatni on inner sides of egg pieces. Then wrap potato mixture around the egg like it were a whole egg. 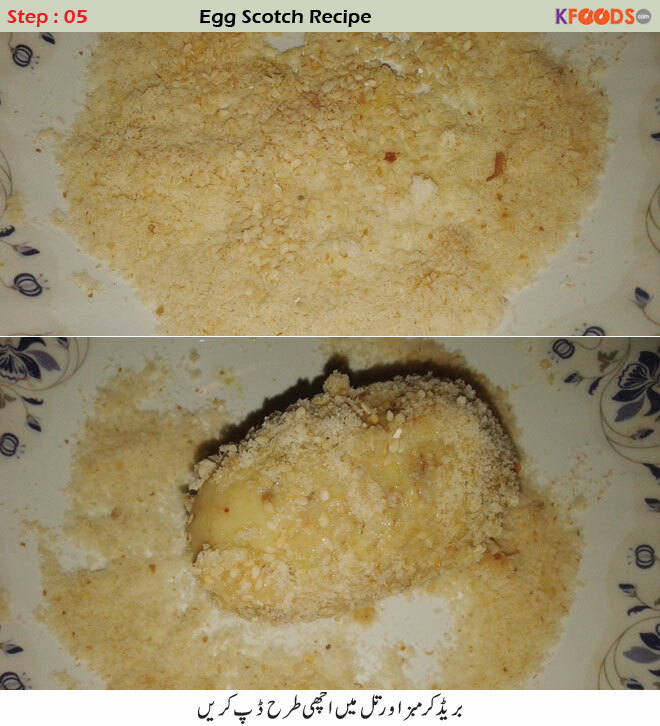 Now dip that potato-wrapped egg in the beaten egg, then mix cumin with breadcrumbs and coat dipped eggs with breadcrumbs. Prepare all eggs likewise. Heat oil in karahi/pan and deep fry all eggs. When they are golden, transfer them on a kitchen tissue. Delicious Egg Scotch is Ready. Enjoy with ketchup! I personally like egg dishes as they are full of proteins, rich in taste and good for kids. 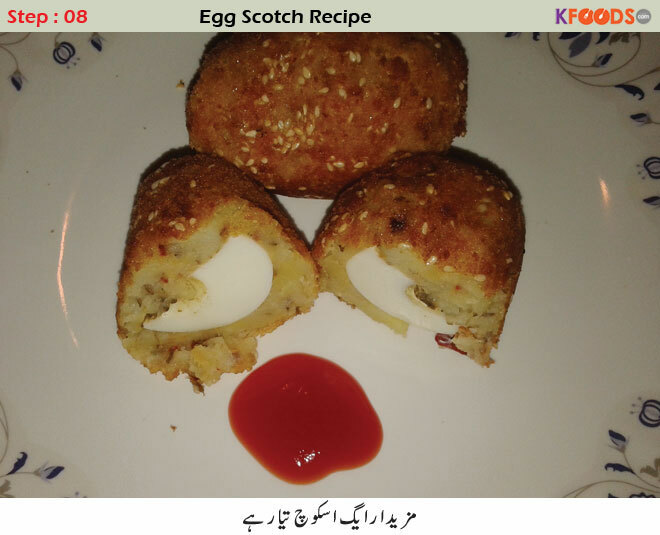 I myself enjoyed making egg scotch and therefore decided to explain how to make egg scotch recipe to you through KFoods.com. I have placed pictures with each of the steps to give you a clear hint for every step. 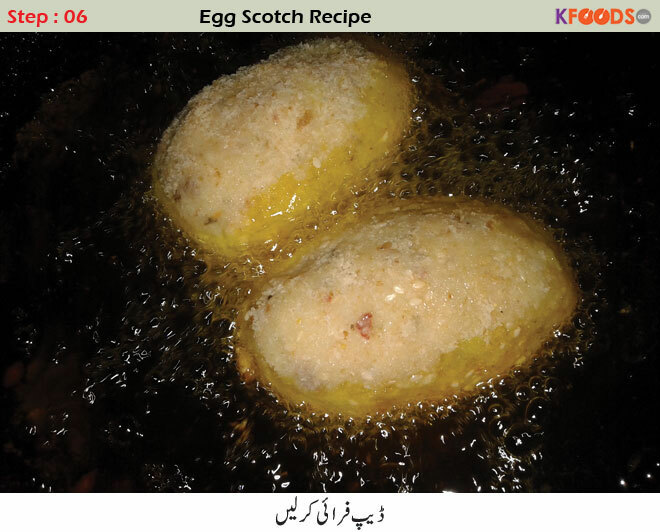 Egg scotch recipe consists of several stages that are making green chatni first, then filling boiled potatoes, and then making egg scotches finally. I recommend having it with chili garlic sauce or ketchup to fully enjoy its taste. It's preparation though takes some time but the final outcome is awesome. 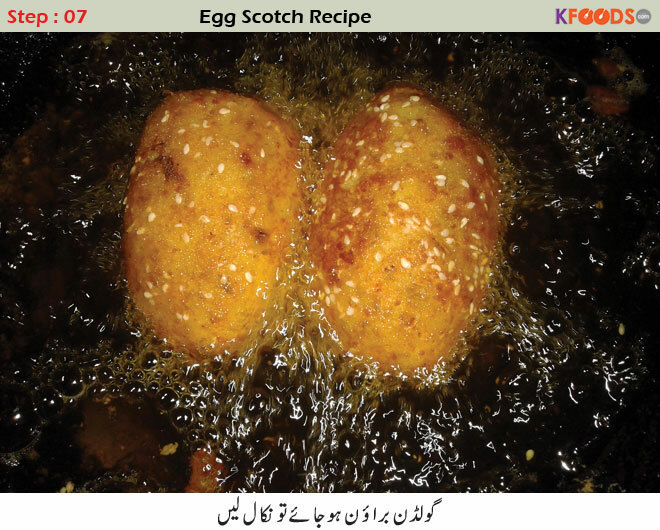 Learn to make delicious egg scotches to enjoy at evenings, at iftar, as lunch side items or to serve to the guests. I have presented the complete recipe in Urdu through KFoods.com. Enjoy the recipe below. Egg Scotch Recipe I personally like egg dishes as they are full of proteins, rich in taste and good for kids.I myself enjoyed making egg scotch and therefore egg scotch recipe to you through to make it easy and thanks to KFoods.com. My husband is very fond of eating egg dishes so I made it for him only. He really adored it a lot and I was so happy that he liked it very much. Thanks a lot for the recipe. hah! My husband asked me to make egg scotch for him on breakfast. Lol, I didn’t know how to make and never made it before. Egg scotch! Do not seem very delicious but I need to try this recipe just because my brother wants to eat this thing. So I have to make it for him only. I am a kind of person who wants to have different type of dishes on my table in iftar time. Well, actually I am so serious about it that I have already listed recipes in my mind. I All of we friends went to a park to have picnic over there and there we enjoyed these outstanding and succulent egg scotch a lot. Thank you so much. Its Ramadan month and everybody wants to eat new dishes. I will surely try to make for my family as they are very fond of eating new dishes. Thank you for the recipe. I never know the way that how to cook egg scotch but you have taught this in a very pleasing and helpful manner. Thank you so much for this much easiness. Egg scotch looks so enticing. I heard about this recipe and supposed that I should try this at home. And now when I have the recipe so I am insisted to make it. 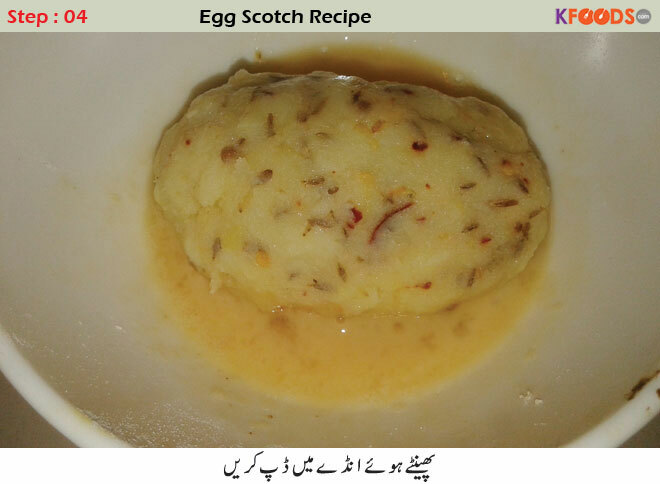 egg scotch is one of the most healthy dish. Egg is made up of proteins so when you try to over-cook them you actually burn those protiens. 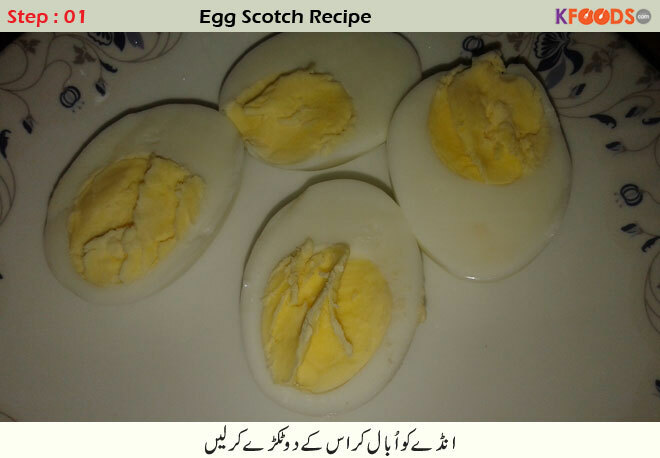 Thank you very much for sharing such a simple and easy recipe for making egg scotch. It was really delectable and enjoyable. Keep on sharing outshine recipes like this one. looks tasty, i will enjoy it for the first time. I am making a list of its ingredients required and then talk to my wife to inquire which ingredients are available at home and which of them are to buy. 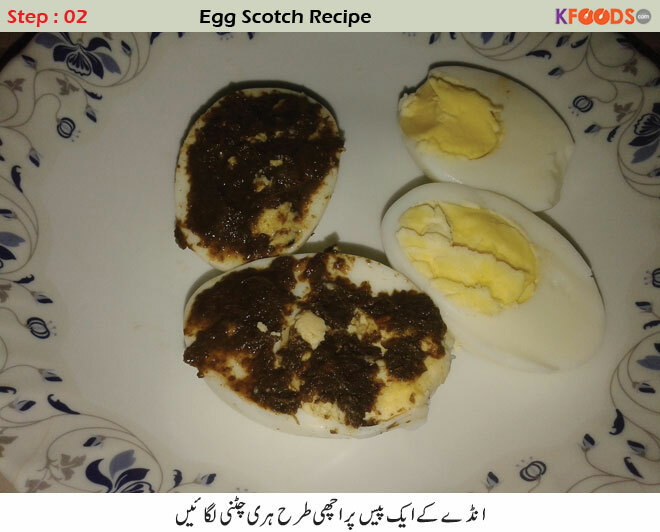 Read Blog about Egg Scotch Recipe and health & fitness, step by step recipes, Beauty & skin care and other related topics with sample homemade solution. Here is variety of health benefits, home-based natural remedies. 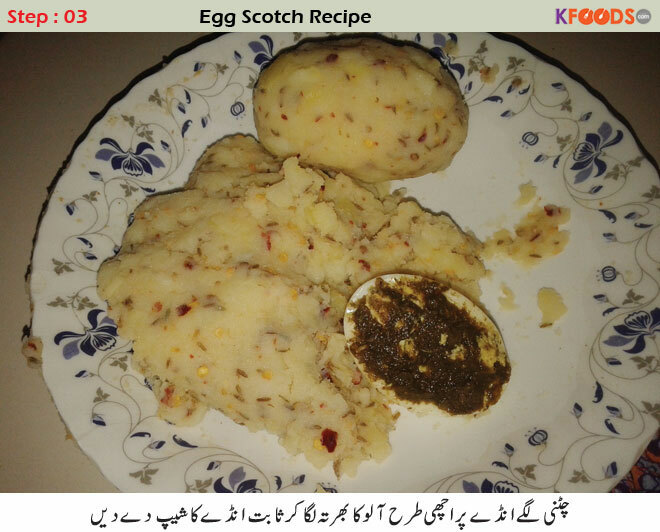 Find (Egg Scotch Recipe) and how to utilize other natural ingredients to cure diseases, easy recipes, and other information related to food from KFoods.